The simplest sort of commission occurs when a client falls in love with one of your works, but it’s already sold. Do you let them go away disappointed? We don’t. Instead, we offer to have the artist execute the same piece in a different size, be it painting or sculpture. This practice dates back to the time of Rembrandt, whose better-known paintings were often executed in three different sizes: study, enlargement, and monumental scale. The pieces are never exactly alike anyway. While they might capture the same mood or scene, there are always slight differences. Most of our artists love this practice, but a few don’t care for it, since the idea of doing the same piece twice bores them, even if in different sizes. But for those who practice it, they always strive to make the second piece as impassioned as the first, so that it radiates its own particular fire. If this approach leads to your first commission, make sure the details are spelled out in a letter of agreement. This should discuss size, price, date of completion, and the fact that you guarantee the client’s satisfaction. I mean you already know you’re going to do good work; the guarantee just clarifies this while winning the client’s confidence. Let’s assume you meet an executive, restaurateur, or politician who wants to commission a large work. If it’s your first commission, please pay attention to what I’m about to cover. It details a set of circumstances that are far more common than not. 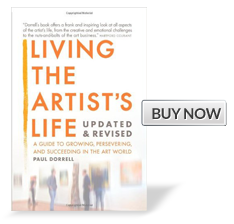 In the beginning with commissions, most emerging artists virtually have to give away their work in order to place it, since until you’re established, it’s hard to get the price you’re worth. I’m not saying you should give it away, only that you’ll face some challenges in this respect until your reputation is established. It’s no different for emerging musicians, like the Rolling Stones when they started out, initially performing for almost nothing just to get a gig. Example: Arlie Regier’s first large commission, prior to joining my gallery, involved a huge work in stainless steel for a city park. He was approached by a local politician about it, and was so thrilled to be placing a substantial piece, that he set the price rather low. This often happens when emerging artists don’t have professional representation, since they tend to underestimate the totality of their expenses, while also hoping the exposure will offset the low price and change their fortunes, not realizing it rarely does. By the time Arlie finished with the hundreds of hours of cutting, welding, grinding and polishing, he regretted giving the city such an insane deal. Worse, no sales resulted after the big dedication. Why? Nothing was promoted. If the installation isn’t promoted—which requires real forethought and effort—it will have little impact on your career. I’d love to tell you that the crowd who shows up on dedication day will automatically start buying your work the day after, but that’s rarely the case. This is why you must have a thorough understanding of what your real costs will be, why you must get the highest price you can, and why someone needs to promote the fact of the commission both while it is taking place and after it has been completed. Just use your creative sense about how you can announce the significance of this achievement without overdoing it. The possibilities are many. If you’re not sure of what steps to take, sit down with some promotion-savvy friends and brainstorm. Taking those steps will help you land future commissions, with you gradually increasing the price as time goes by. When you secure a commission, you should draw up a letter of agreement before you proceed with any work and before any money changes hands. This is essential, as it spells out the terms for everyone involved, and normally prevents misunderstandings from occurring later. I’ve provided a sample letter below, based on one we recently used with a patron who was sponsoring a sculpture for a major city. This is to establish terms between Matt Kirby, Artist, Gloria Swanson, Client, and Leopold Gallery, Art Advisor, in the creation of a monumental sculpture for City of the Angels. —Design: A sculpture in stainless steel, mild steel, and cast glass, created to conform to the original design, as submitted by Artist and approved by Client. —Dimensions: 16’ high, 5’ wide, 14’ deep. —Gross Weight: Approximately 3000 lbs. —Finish: The mild steel aspects will be powder-coated in a black, mat finish. The stainless steel and cast glass require no special finish. —Commission Amount: $95,000, which includes delivery and installation. —Mounting Method: The method of mounting will be approved by a certified structural engineer, as will the stability of the sculpture, which will be fabricated in such a way as to warrant that the steel will not develop metal fatigue from wind, gravity, or natural lateral forces for the duration of its placement. Exceptions will be made in the events of vandalism, accidental damage, extreme weather, or Acts of God. All aspects of fabrication and installation will be approved by Art Advisor and Client. —Installation: Artist will supervise installation, in concert with Art Advisor. —Client Approval: Artist warrants that overall design, installation method, and metal quality are subject to approval by Client and Art Advisor. —Client Monitoring: Client will be kept informed of progress via digital photography, periodically submitted by Art Advisor, as well as by studio visits. ­—Deadline: Work will be completed and installed by November 3, 2010. —Copyright: Artist retains copyright, but will grant Client usage in non-salable printed materials and internet promotions, as long as Artist is given credit in each instance. —Terms: $47,500 downpayment; $23,750 when work is halfway completed; balance upon installation and satisfaction of client. With sufficiency acknowledged, I sign my name to the above. A lawyer didn’t draw this up, I did, although I advised my client to have her lawyer approve it. As for my part, I trust my business sense in landing commissions, negotiating them, and working out the details. Hence I rarely involve lawyers in formalizing agreements, since that tends to delay matters, drives up costs, and can inspire mistrust. But when I do need a lawyer for complex contracts, I hire one who operates on the same basis of mutual fairness that I do. It’s up to you whether you choose to involve an attorney. If you don’t, just make sure that someone with a keen business mind proofs the agreement, looking for weaknesses or missing details. Regarding the commission for the sculpture described above, we didn’t get the first price we presented, so I had to negotiate to a slightly lower price—which I’d anticipated, so started with a higher price than I thought we would get anyway. The price we did get in the end was satisfactory. By the time the installation was complete, the client was ecstatic, the press coverage good, and the success of that work led to other commissions—but again, only because we promoted the sculptor, good old Matt Kirby. If you’re a painter and are comfortable with large-scale work, galleries that represent you will hopefully begin securing commissions—a task that will be made easier if you’ve already handled a few on your own. Some of these commissions may be large in scale, others modest. I’ve handled scores of them, some for as much as $50,000, others for as little as $1700. If the commission is for a moderately large painting like a 30” x 40”, it will normally require a study. The study will be small, say 9” x 12”, and should conform in scale to the dimensions of the larger work. It should also be a fairly accurate reference as to how the larger painting will look. The large work will be better defined and possibly more inspired, but the study will provide the client and you with a map of how you’re going to get there. You can also sell it to the client after the commission is complete, or just sell it on the open market. We always invite our clients to the artist’s studio as a commission nears completion. They love that process, and in this way nobody gets any surprises. Normally the client is stunned by the piece, and offers few, if any, suggestions. If they do offer criticism, which it is my job to interpret and keep a handle on, we listen. While I never allow a work to be dictated by a client, I do pay attention to their wishes, and several times have found their requests worth acting on. After all they’re paying for the piece, so they should be as passionate about the finished work as the artist is. As long as the artist is cool with the requests, it’s just good business. Except for a few basic differences, sculpture commissions are similar to those for large paintings. Primary among those differences is price. Sculpture almost always costs more than paintings, owing to the higher cost of materials and normally the greater amount of labor that is required. Thus, as I mentioned earlier, you must have a clear grasp of your expenses before setting your price. Go over the costs carefully, trying hard to consider all the things you may not have anticipated, then add twenty percent. The client will likely try to negotiate anyway, and because most sculptors underestimate their expenses in the beginning, it’s best to be prepared. If you’re working in bronze, you’ll have to sculpt a clay maquette, but don’t cast it unless the expense for this is covered in the contract. Whenever I land my bronze sculptors a large commission, we always provide the client with a cast version of the maquette, but only because the casting fee is figured into our costs. In other words, our clients pay for the casting of a maquette. We don’t, and neither should you. With most other materials—wood, fiber, steel, ceramic—create the maquette so that it is close to the large piece in terms of scale, design and detail. Of course it will never have the power of the large work, which will probably evolve as you go up with it. No matter, just explain this simple reality of sculpting to the client. If they’re impressed with your other installations, they’ll follow your lead. My percentage on these larger commissions depends on the medium, and on the artist’s expenses. On big bronze commissions, like the D-Day Memorial, I make twenty percent of gross. On large projects in stainless steel and other media, I tend to make thirty-three percent.